Next month — May 22, to be exact — will mark the fifth anniversary of the passing of world-famous oud player Hamza El Din. Born in southern Egypt, he studied in engineering in Cairo before tdevoting himself completely to preserving Nubian musical traditions. He played all over the world, recorded with everyone from the Kronos Quartet to the Grateful Dead, and eventually settled here in Oakland, California. I hope El Din’s many local admirers and collaborators are planning a musical tribute to conmemorate his passing. 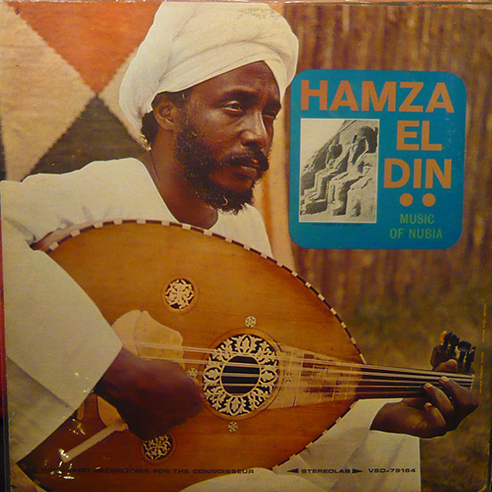 In the meantime, here’s a track from his 1964 debut of Vanguard Records, “Hoi to Irkil Fagiu”, performed with Ahmed Abdul Malik on the string bass. And here’s the Kronos Quartet playing “Escalay”, an El Din composition. This entry was posted in PELANGA RECORDS! and tagged Egypt, Hamza El Din, Kronos Quartet, Oaklandia by Franz Tunda. Bookmark the permalink. This music moves you…powerfully! (I touched my cheek and realized it was a tear). Thank you for sharing this man’s work.